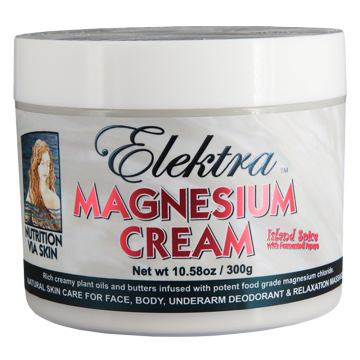 One dessertspoon of Elektra Magnesium Island Spice magnesium cream to cover the whole body provides approx. 250-300mg of elemental magnesium, equivalent to the average daily recommended magnesium requirement. Some individuals may need two or three times this much magnesium in cases of more severe magnesium deficiency. In this case extra magnesium can be supplied via Elektra Magnesium Oil Spritz, as well as foot soaking or bathing with Elektra Magnesium Flakes. CONTAINS: Purified water, 15% Elektra Magnesium chloride hexahydrate, Butyrospermum parkii (shea) butter, naturally fermented papaya enzymes (made from Carica papaya fruit &amp; seeds extract, paw paw leaf extract and green tea extract), Cocos nucifera (coconut) oil, Cetearyl alcohol, Prunus amygdalus dulcis (sweet almond) oil, Prunus armeniaca (apricot) kernel oil, Ceteareth-20, Theobroma cacao (cocoa) seed butter, Mangifera indica (mango) seed butter, Lecithin, Cannabis sativa (hemp) seed oil, Tocopherol (vitamin E), Glyceryl caprylate, Xanthan gum, Vegetable glycerine, Azadirachta indica (neem) oil, Potassium sorbate, Vitamin D3 (cholecalciferol), p-Anisic acid, Alpha lipoic acid, Citric acid, Vitamin B3 (Niacinamide), Vitamin B6 (Pyridoxine HCL), Essential oils of: Pelargonium graveolens (geranium egypt), Michelia alba and Ravensara aromatica.